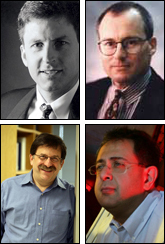 Clockwise from top left, Bill Bentley, Greg Payne, Reza Ghodssi, Gary Rubloff. Associate Professor Reza Ghodssi (ECE/ISR) and Maryland NanoCenter Director and Professor Gary Rubloff (MSE/ISR/ECE) are part of a new four-year, nearly $2 million National Science Foundation Emerging Frontiers in Research and Innovation-Cellular and Biomolecular Engineering (EFRI-CBE) grant. EFRI is NSF's newest and most competitive grant; only 12 were awarded in this cycle. The goal of Biofunctionalized Devices—On Chip Signaling and "Rewiring" Bacterial Cell-Cell Communication is to demonstrate signal translation by employing device-based electrical signals to guide the assembly of biosynthetic pathways, cell-based sensors, and cell-based actuators within a microelectromechnical system (MEMS); and to use on-board electrical, magnetic, mechanical, and optical systems to feedback and guide the cell-based system towards user-specified outcomes. The principal investigator for the project is Professor William Bentley, chair of the University of Maryland's Fischell Department of Bioengineering. In addition to Ghodssi and Rubloff, the investigative team also includes Gregory Payne, director of the Center for Biosystems Research at the University of Maryland Biotechnology Institute. Ghodssi is the principal investigator for the ECE/ISR portion of the grant. The target of this project is the cell-cell communication system mediated by bacterial signaling autoinducers in a process known as quorum sensing. The PIs have created a computational model that captures the dynamics of quorum signal generation, receptor driven recognition, and uptake. This model, based on biochemical and biophysical processes, will help the conceptual design of subsystem synthons assembled architectures that guide heterologous protein synthesis in response to specific biomolecular cues. Cells will be signaled to initiate biofilm formation and maturation. The MEMS environment will enable for the first time, an experimental platform for the design, construction, and testing of this cell-based signal transduction process. Moreover, this MEMS environment will detect cell function and, by guiding signaling pathways, change cell phenotype in a controlled and directed manner. The PIs will enlist guidance and support from industry, which may spawn new efforts in device fabrication, embedded sensor systems, bacterial pathogenicity, biofilm formation, genetic regulation and signal transduction. Developments are envisioned that impact fields of medicine (drug discovery, synthesis, and delivery), communications (biofunctionalized microfabricated devices), and security (smart sensors).